Follow up to #4863, see discussion there (so, I removed the External link action menu, and as a compensation, I allowed external links on swipe :). Removed "Swipe to follow first link on page" menu item and handling code, as it feels not really as practical as "Swipe to follow nearest link". Removed recently added "External link action", as we can just always present a popup with the url and the available actions. 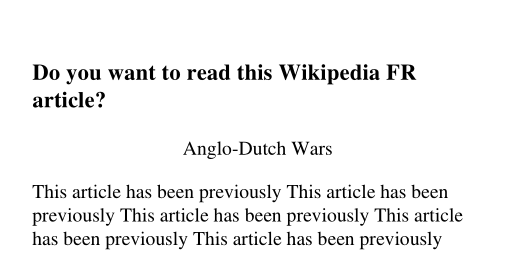 Generic handling of these actions in onGoToExternalLink(), so they are proposed on the Wikipedia lookup popup too. Allow external link on PDF documents (previously, only internal links were handled). 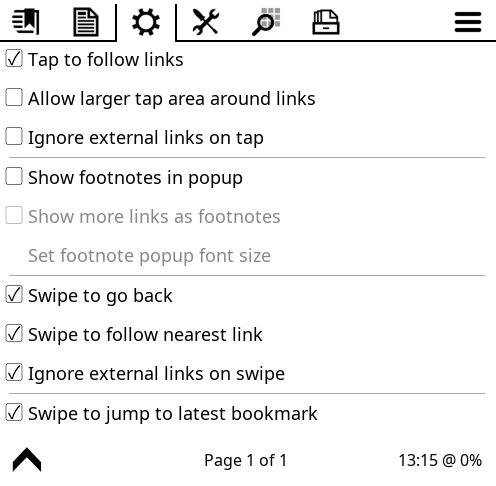 Have "Ignore external links on tap" available on all document types. Added "Ignore external links on swipe" (default to true, the current behaviour). ButtonDialogTitle: added an option to look a bit more alike ConfirmBoxes. 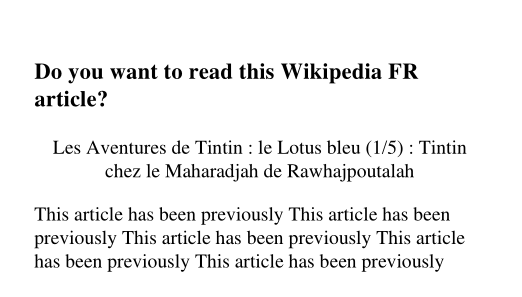 Footnote popups: fix link unhighlight when tap on external link. 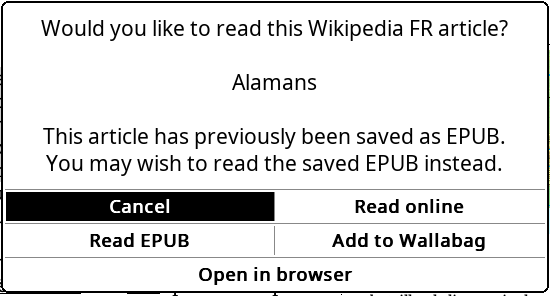 I'm not really fond of the switch for Wikipedia popup from the ConfirmBox & MultiConfirmBox to this ButtonDialogTitle, but I guess I'll get used to it (the removal of the Info icon make more room for the article title, so I guess it's good). I think defaulting to ignoring is an unintuitive default. I disagree for swipe, which is there for a few years and evoke the physical gesture of turning pages to jump to footnotes and back. Having it suddently throw a popup is not a good thing. Well, from the multiswipe gesture, it could be another default or setting. But I don't feel like adding yet another setting for that. 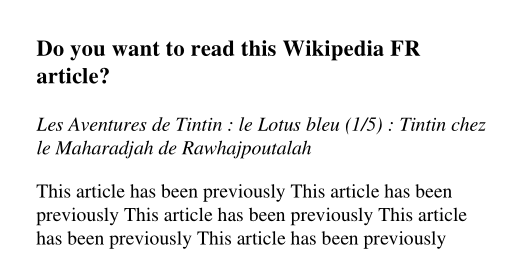 So let's have it the same as in readerlink. It breaks the concept of links as well as the internal logic for ignoring external links. For the gesture manager you could just make two actions: the current one that follows all links, and a new one called follow_nearest_internal_link. Ok, went with 2 actions, hardcoded false and hardcoded true, not using the single swipe ignore setting. "Swipe to follow nearest link". 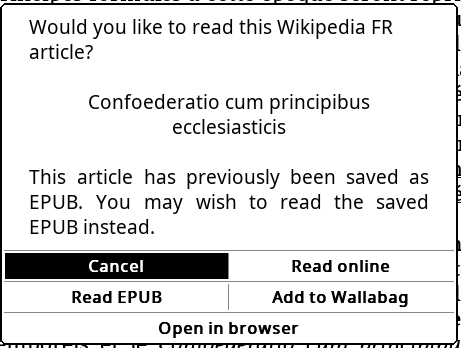 so they are proposed on the Wikipedia lookup popup too. - Added multiswipe gesture "Follow nearest internal link"
- Footnote popups: fix link unhighlight when tap on external link. Would it look a bit better, more balanced, with the text centered (with just adding title_align = "center") ? I don't think it does. Better, that is. I like it for actual titles, not so much for multiline links, FWIW ;). Been toying with adding some kind of PTF (Poor Text Format) to TextBoxWidget, so we could specify alignment hints on individual lines in text fed to TextBoxWidget. editable = false, -- Editable flag for whether drawing the cursor or not. alignment = "left", -- or "center", "right"
could we just use more obvious single ASCII chars to hint that alignment? I don't see anything obvious ([<=_~). 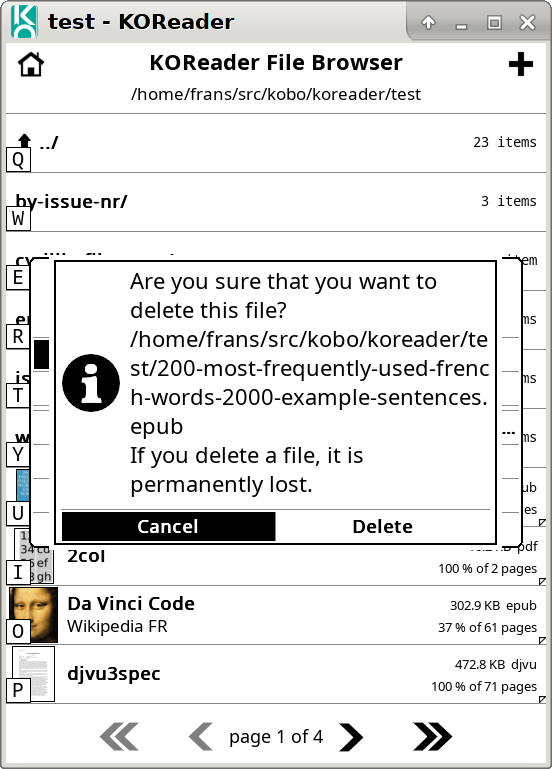 If you want to experiment with typography, why not just use the rich text widget we have at our disposal these days? No centering, just something like a simple <strong></strong>, possibly combined with a little margin:0 1em. After having achieved a general look and functionality, you can switch to Markdown instead for simpler internationalization. Avoid the use of italic or oblique faces, as these are visually more complex, and can be distracting. That's why I asked for alternative suggestions. 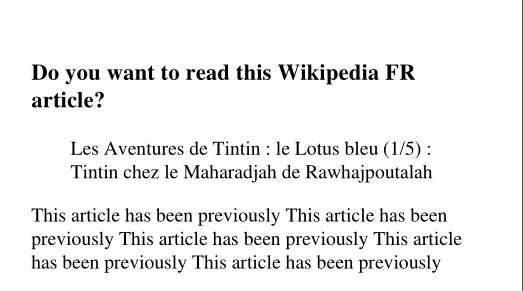 text = T(_("Would you like to read this Wikipedia %1 article? "), wiki_lang:upper()) .. 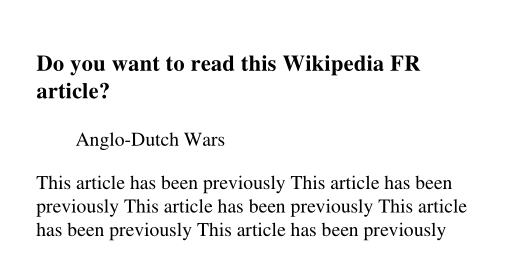 I don't :) Just wanted a quick solution to this not that nice display of the Wikipedia article title. It's just that if they were already some kind of simple embedded line formatting syntax from the 1990s, simpler that Markdow, we could justify supporting that, instead of my unicode private use chars. But I'm not that fond of my TextBoxWidget tweaks. No problem just forgetting it. I am because I'm not talking about simple, although even merely implementing support for **strong** would suboptimally improve most current use cases. It would still be a relatively limited number either way. You shouldn't use HTML, but Markdown. 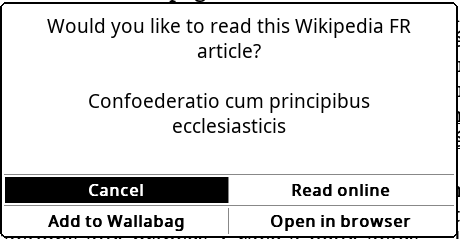 Would you like to read this Wikipedia %1 article? The specifics don't necessarily matter too much. Ideally the element base style suffices, but you can pass along some minor adjustments in the stylesheet. I don't agree that it should be centered. I think it looks unbalanced in combination with a ragged-right edge. NB I don't think "balanced" is a particularly important metric, unless all else is roughly equal. I think blockquote or emphasized does a better job.